Brilliance and passion at display at the annual NGIRI Championship today, where students displayed final year projects, funded by Ignite – National Technology Fund, that use technology to solve problems. Federal Minister for IT & Telecom Dr. Khalid Maqbool Siddiqui, Chairman PTA, Maj Gen (R.) Amir Azeem Bajwa, Rector GIKI, Jehangir Bashar, and CEO USF, Rizwan Mir, encouraged and inspired students and their supervisors. Special thanks to the judges, 5 ladies and 5 gentlemen, including Shahida Saleem, Farhat Bashir, Asim Ghaffar, and Murtaza Zaidi, leaders of the innovation and entrepreneurial ecosystem, who selected the champions, though all participants were winners because these projects inculcate skills in demand today and tomorrow: Creativity, hands-on-engineering, and soft skills like work ethics, team spirit, and perseverance. Some will go on to build industry grade products, which proliferate, like Ali Gul, one of last years champs, with his smart helmet for miners, now under testing by the Baluchistan Government Mines Department. Jawad Azfar and team put the NGIRI program together, and Nadeem Nasir put the event together, which trended #1 on Twitter for quite a while. Some worthwhile innovative projects: Gas leakage kills thousands annually, a BUITEMS Quetta team built a detector that sets off alarms, activates exhausts, shuts down supply and provides cell notification. Cyber attackers can steal passwords; University of Hazara, Mansera, has built a numeric-alphabet encoder, which allows you to enter numbers that correspond to letters in a password field, rather than the actual password, which reduces chances of theft. With the proliferation of drones, controlling them can be challenge for many; CECOS, Peshawar has developed a wearable motion-based controller. NUST Islamabad has built a vibration based therapeutic device for neurological disorders, which you apply to different spots in your head and forehead for quick relief. An AI powered spoken language translator from local Gilgit-Baltistan languages to Urdu and English, to support the imminent tourist surge, by Karakoram University, Gilgit. 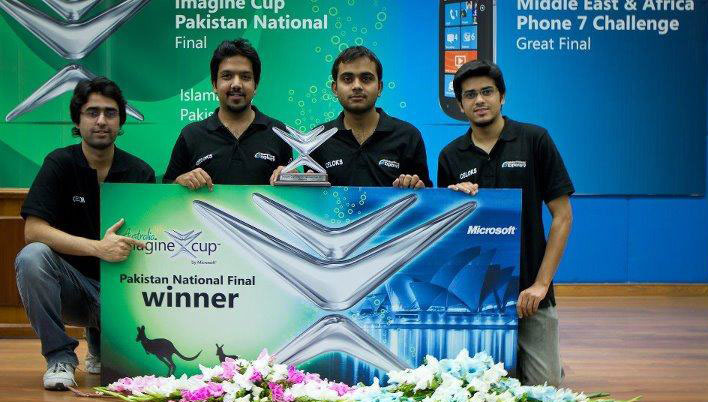 The Winner: Usman Institute of Technology, Karachi, team project, which converts organic garbage into white coal. First Runner Up: UMT, Lahore microgrid to smooth electricity fluctuations. AI powered website where you paste pictures of plants with suspected diseases, which diagnoses the disease, by Fatima Jinnah Women’s University, Rawalpindi. A drone that estimates crop productivity and detects diseases, by the University of Balochistan, Quetta. A self driving material transfer vehicle by Mirpur University, Azad Kashmir. The Air University team, uses AI to diagnose heart disease from ECG monitors. FAST Islamabad’s Raspberry Pie based high performance parallel processing computer for matrix manipulation, accessible from the cloud. Institute of Space Technology’s Can Satellite for educational purposes. Second Runner Up: GIKI crypto currency predictor. A hand held presentation controller that you can use to click on a projected computer screen, roll a presentation forward or backward, and even prevent light from the projector to fall on your face; An IoT based garbage can that monitors garbage levels, helps optimally route garbage trucks saving loads of fuel, and suggest where to place additional garbage cans, by IBA Sukker. Addressing the ceremony held to award winners of the National Grassroots ICT Research Initiative (NGIRI) Championship Federal Minister for Information Technology and Telecommunication Dr Khalid Maqbool Siddiqui said his ministry was endeavouring to provide academic and entrepreneurial growth opportunities to the youth. The minister appreciated the students’ technological acumen, which, he said, was not only commendable but would also bring homegrown solution to local and international problems. He congratulated winners of NGIRI Championship and said that winning was important but the journey should not stop here. “Winning students must take their prototypes to next level and those who could not make it this time should improve upon their ideas and prototypes,” the minister said. Earlier speaking on the occasion, CEO Ignite Yusuf Hussain said the work force of the future would need creativity, programming and other practical skills, and soft skills like team work for advancements in their careers. Cash prize of Rs400,000/- was awarded to the first position holder from Usman Institute of Technology, Karachi for their project: White Coal Machine. 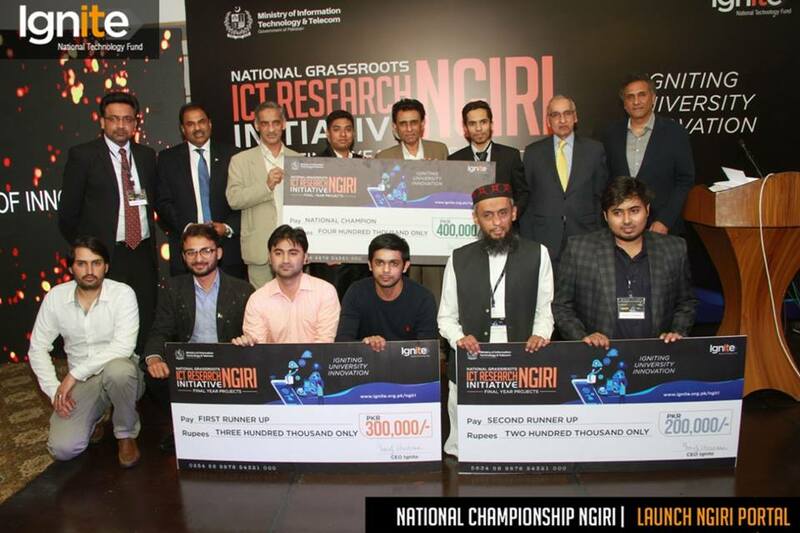 Second position was won by University of Management of Technology, Lahore with cash prize of Rs300,000/- for their project titled Control and Operation of Micro-Grid while the third position with cash prize of Rs200,000/- went to GIKI for their project titled Crypto Currency Predictor. Five final year projects were given wild entries to National Incubation Center Islamabad, Lahore, Peshawar, Karachi and Quetta. 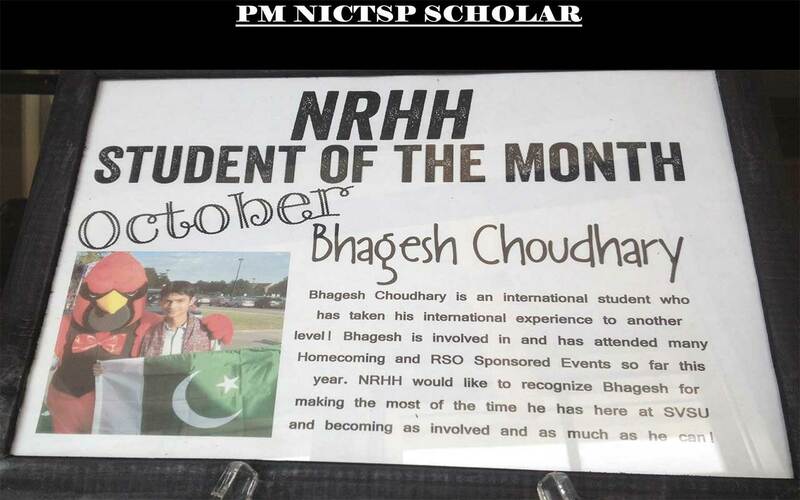 The projects included Gas Leakage Safety from Balochistan University of Information Technology and Management Sciences Quetta, Electric Self-Driving Logistic Vehicle from Mirpur University of Science and Technology (MUST), Mirpur AJ&K, UoH Gas Safety Project from University of Haripur, Load Sharing in DC Microgrid for Effective Utilization of Renewable Energy Resources from University of Lahore, Online Monitoring of Electrical Transformer by Monitoring Load Current from National University of Science & Technology (NUST), PNEC, Karachi.